Now that lovely fresh food is abundant here in Maine, I’m working on bolstering my collection of stock food images. Wandering around, peering into people’s gardens this time of year (yes, I’m a nosy neigbhor, and I love looking at others’ gardens), you’ll often see pom-pom-like, pale purple blossoms sitting atop thin, vibrant green spikes. Chives, the smallest species of the onion or allium family, are a hearty plant that come back year after year and tend to expand each year. I didn’t know until I saw them for sale at the farmers’ market a couple of years ago that the lovely lavendar blossoms are just as tasty as the green part of the plant. 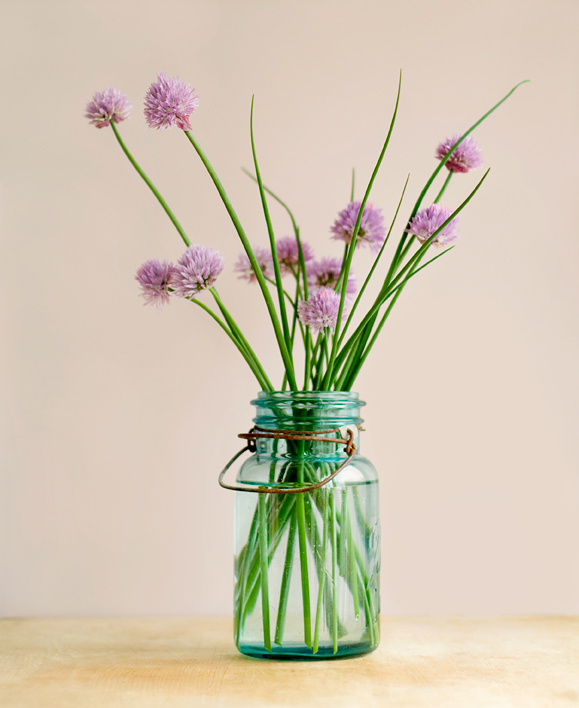 Cut several chives with the blossoms on top to make a beautiful and fragrant bouquet and put them in your kitchen. With them in your line of sight as you’re cooking, you’ll remember to use them more often than if they’re outside. You can serve them whole in salads for a colorful touch or snip them and sprinkle over pasta, pizza, risotto or any other dish that could benefit from a slight oniony flavor. Enjoy! This entry was posted in food and tagged chive blossoms, chives, edible flowers, food photography on June 8, 2009 by Stacey Cramp. Plus, they smell like McDonald’s pickles! I just got some garlic scapes from my CSA. They are so beautiful and I thought of you and your camera. They also make great pesto. Your photo of the chives is beautiful….maybe my next birthday. Thanks, Sylvie! What a timely message. You’re so lucky you got garlic scapes already. I think we’re still a few weeks away based on what I can tell from looking at the garlic plants in our garden, but a friend of ours who has an amazing farm in West Virginia sent us some in the mail and they arrived today! We’re also thinking of having scape pesto tonight. I have a really cool garlic bulb and scape shot that I so wanted to use in the calendar, but it would have meant doing away with blueberries or lobster!